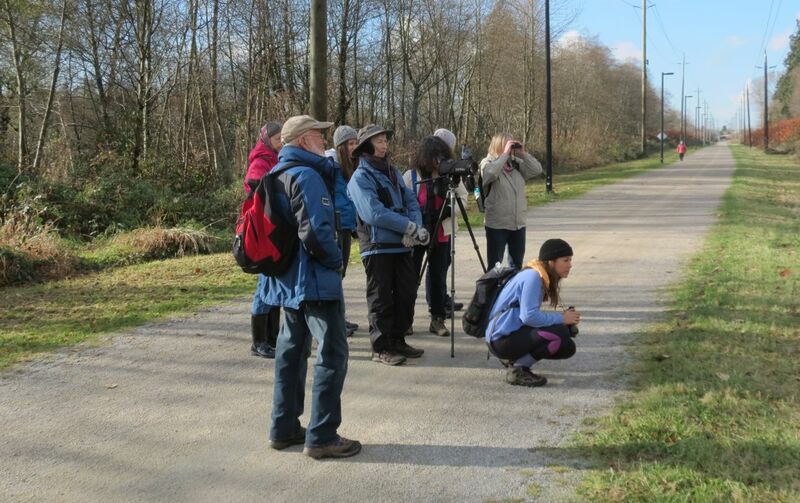 Saturday November 22, 2014 saw the inaugural walk in the series I’ll be leading over the next few months called Exploring Burnaby’s Parks and Natural Areas. A keen group of eleven participants, we found ourselves outdoors on a beautiful fall morning – blue sky, fluffy cumulus clouds, and sun. Yes, sun. Luckily, it seemed the weather gods were looking upon our enterprise favourably. We managed to find the one fine day between soaking Pacific fronts that had been storming across the region on the belly of the jet stream for a week; and then continued the downpours afterwards. Starting at the rugby fields at the foot of Sprott St., we wanted to see as much as we could during a relaxed 3 hour walk by following the Still Creek corridor upstream from its outlet at Burnaby Lake. Cackling Goose. 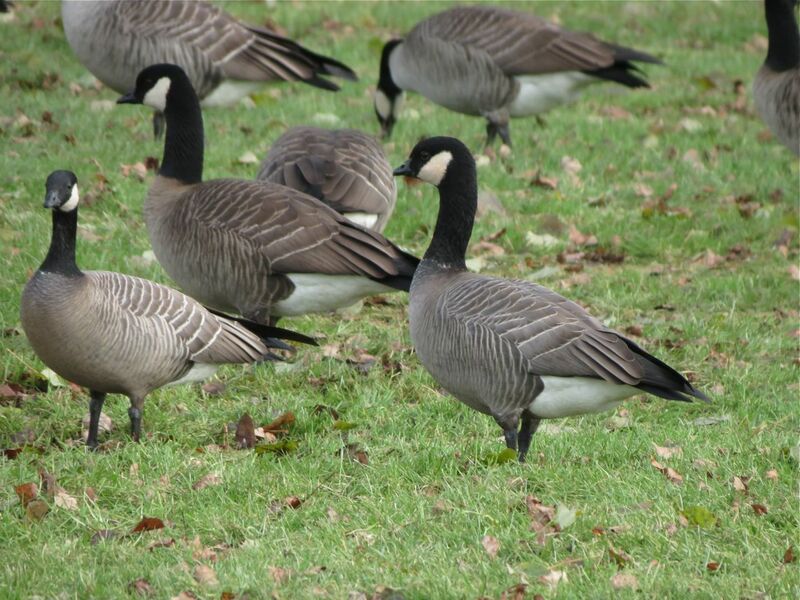 Note the darker colour, small, rounded head, short neck, and small bill which separate the Cackling from the Canada. Looking around from the parking area, we had excellent views of a flock of American Goldfinches actively feeding in the treetops. After walking across the fields to the banks of Still Creek, we were soon appreciating the many waterbirds at the mouth of Still Creek including Double-crested Cormorants, Buffleheads, and Common Mergansers. Shortly after, we walked north-west along the creek where we saw our Bird of the Day, a beautiful adult Northern Shrike, an uncommon bird in Burnaby. Perched at the top of a large black cottonwood, it was out of camera range unfortunately, but the spotting scope provided great views for everyone. As we continued, a shrubby area off the main trail featured our most active group of birds for the morning feasting on the berry-sized fruit of Pacific crab apple trees, and red-berried hawthorns. Cedar Waxwings, Purple Finches, American Robins, Spotted Towhees, and Fox Sparrows made up the mixed feeding flock. A full list of our sightings on November 22 is shown below.